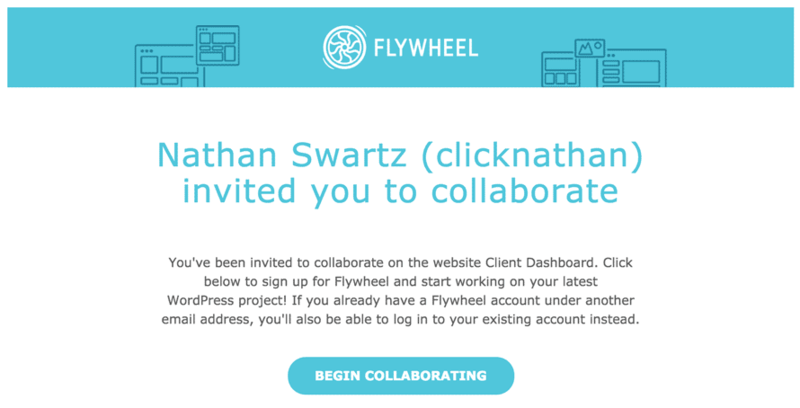 Like other Managed WP Hosting services, Flywheel has a control panel unlike what you’ll be used to if you’ve lived in a cPanel environment in your previous hosting experiences. Let’s take a look at what’s in there, what we can do, and maybe what we shouldn’t do. This is where you’ll get started. From here, you can Add Collaborators, which gives them access to the control panel as well, just click the button and enter their email address. Now we’ve got our collaborator setup ready to go, and can dive into the rest. To the right of the collaborators section, you can edit which domains should be setup on this site. 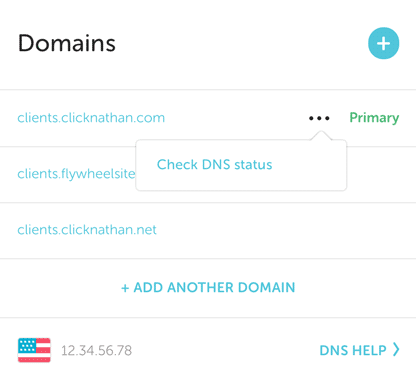 This allows you to use yourdomain.com instead of some-subdomain.flywheelsites.com, as well as add additional domains (in the example below, I have clients.clicknathan.com and clients.clicknathan.net both set to work with this account). Note the little flyout that says “Check DNS Status”. Each domain will have one of these as you hover over it, so you can set certain domains to be the primary one (all others will forward to that domain on the actual live site). Where it says “12.34.56.78” in that screenshot above, this is your IP address and when you’re ready to point your domain name to the site, you’ll use that to set an A record with your domain registrar. You can toggle this button in order to put a password on the entire site (different from your WordPress password, this will actually lock down the front end as well). This allows you to keep a site hidden from the public while you’re in development mode, or for whatever other reason. 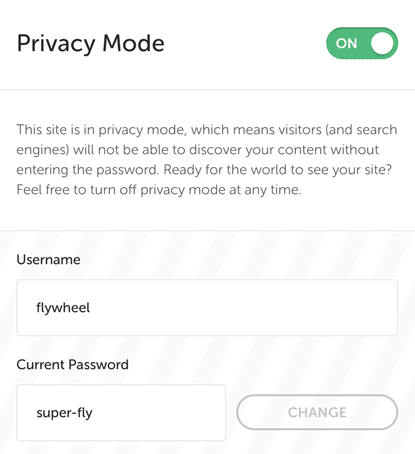 You can also change the username and password for the site in this area as well, but only when you have Privacy Mode turned on. Pretty self-explanatory, this area shows you how many visits your site has and how much traffic you’ve experienced this month (compared to your max). If you’re a hosting client with ClickNathan, you have no maximum, FYI, as long as you’re uploading files through WordPress and not using your hosting service as a media / backup storage service. If you’re a client of mine, you don’t need do anything in this area, it’s all setup as it should be for you. Here you can add necessary things, like an SSL certificate (so your site is secure, which Google wants, and Chrome will issue a warning against if you don’t have this setup) or a CDN. A CDN is a way to store and serve your images and other files from another server, which can speed up your site, but at $8 / month it isn’t necessary unless you’ve got a really high traffic site. Here you can view, download and restore backups of your site, which typically go back about thirty days. As the name implies, this section is for those of you who feel comfortable taking actions that could potentially harm your site. Let’s walk through it all so we can avoid that, shall we? Any time you aren’t seeing updates to the site being made (say you add a plugin or make some changes to your theme templates or CSS code, for example), you can come in here and flush the cache, which should solve your problem. 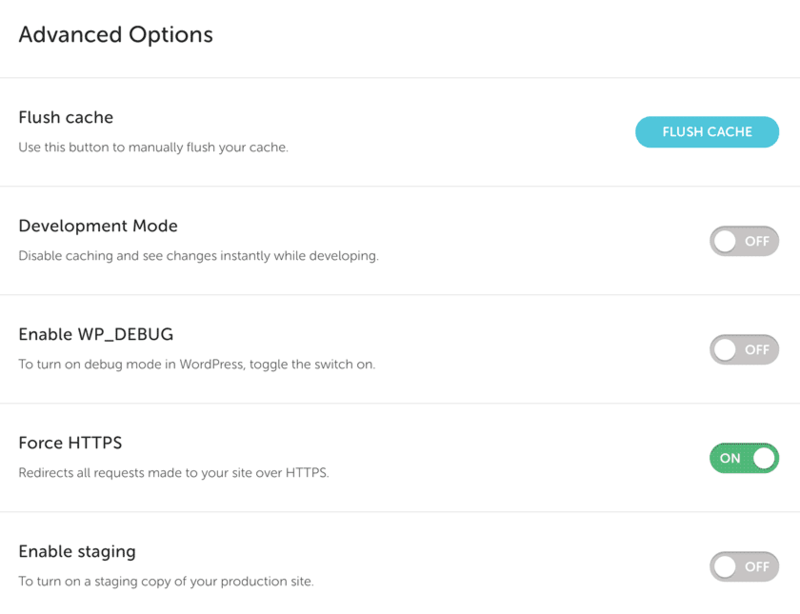 This will turn the cache off altogether, making it easier to develop a new site or make changes to an existing one, but will also remove the awesome caching that is one of the biggest reasons to use Flywheel. You can’t edit wp-config.php with FlyWheel, so if you want to debug, you’ve got to do it here. Note that this will cause any PHP errors to be reported live on your actual site. This will force your http://website.com to redirect to https://website.com, but note you’ll need to verify you have your SSL setup correctly in the Add-ons tab. You may also need to download your database and do a search and replace to get that last ‘s’ on there. This gives you the ability to create an exact copy of your site, which you can then tinker with sans worries about what will happen with the live site where your actual visitors can see. Here you can download a file where you can see any issues that might be coming up with the site. Here you can access tools to work with your database, but note that Flywheel doesn’t provide PHPMyAdmin. More or less you can drop, export and import tables, as well as execute SQL if you know how to do such a thing.